What are you listening to - music/podcasts? A Seat at the Table by Solange and Freetown Sound by Blood Orange are absolutely tremendous. And in the shop, we have a really great fall playlist with Erykah Badu, Lauryn Hill, Chairlift, and Janelle Monae. And Patti Smith—always. I would like to listen to podcasts more often, including Radio Cherry Bombe, A Couple Cooks, and Still Processing. What was the last lesson you learnt? Acknowledging self-worth instead of being self-deprecating; and learning to accept a compliment instead of immediately shifting focus. This doesn't mean losing grace and humility, but now that I’m self-employed and run a business, I’ve learned it’s vital to take credit where credit is due and promote our work! Do you have any current obsessions? Eve Babitz. Her book Slow Days, Fast Company was just reissued by NYRB. Solange’s videos (Cranes in the Sky and Don’t Touch My Hair) are so lush and conceptual! The fashion, choreography, and color are simply mesmerizing. - How's your work/life balance going? Very integrated! My husband (Benjamin) is my business partner and we literally live above our shop. I feel lucky, though—I worked at a design agency for 7 years prior, which was a total dream, but I found myself constantly starting side projects with my friends and with Ben. Finally, I decided maybe the side projects should be the main thing! So now we're doing PRINTtEXT full-time, and I've somehow arranged for all my creative outlets to build towards my work—magazines (of course), books, music, TV, movies. To really unwind, I love cooking—it's part science, part magic—and involves all your senses. Especially that feeling of astonishment/accomplishment when you can't believe you made the meal in front of you! What are you up to work-wise this week? We just published our first book by PRINTtEXT—an INDPLS GUIDE—so we've been working on distribution, promotion, etc for that! We've also had some new projects on the go: a photo shoot with an artist friend, Lauren Zoll; working to develop a narrative (both textual and visual) for an incredible composer and vocalist, Hanna Benn and planning for our next DIDACTIC (a broadsheet periodical we design and edit) for Syntax Season which is an art series we host at the shop). We’ve been producing a lot of work this year, so I’m really looking forward to taking a moment to replenish and consume! So you've been working on a city guide, do you have any good social tips of restaurants/bars you've been to recently in Indianapolis? Lots! Martha Hoover runs some of my favorite spots in Indy, including Napolese (a pizza place) and Public Greens - a restaurant and microfarm which donates all profits and crops back to food programs for kids). And I love our City Market — from Three Carrots’ vegan deliciousness, Spice Box’s chana masala, Tamale Place’s veggie tacos, and the most magnificent croissants at Circle City Sweets. What is the best place you've travelled to this year? 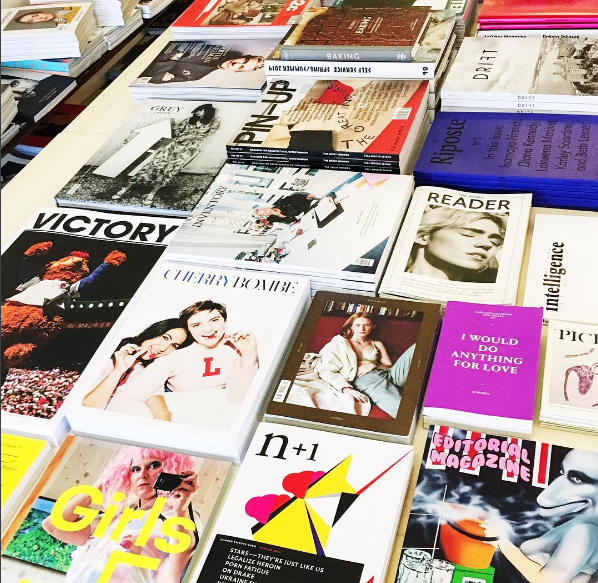 New York in September—the weather was heavenly, and there's this week we always go when the most amazing things overlap: fashion week, gallery openings, and New York Art Book Fair. When was the last time you fucked up? We had a glaring typo on a recent project that was totally my fault and drives me absolutely crazy every time I see it! I have to restrain myself from pointing it out and apologising to every person that picks it up. What would you like to read about in the next issue of Riposte? President Hillary Clinton and women who run the world! And I love that women have been taking over leadership roles in publishing, production, and design— and how they're restructuring those paradigms. But actually, when it comes down to it, what I love most about magazines is the serendipity—reading about someone or something you didn’t know you were searching for.